Two story home with 3 bedrooms and 2 full bathrooms. Main floor is an open concept living room, dining and kitchen that look out to the over-sized fenced backyard. Upstairs is the master bedroom with it's own bathroom, along with two other bedrooms with walk-in closets and a hall bathroom with tub. The basement is partial finished with an additional unfinished room with laundry hookups and lots of extra storage. Extras include two car garage, fenced backyard and is located at the end of a quiet cul de sac. Property is pet friendly, owners will allow up to 2 pets, cats or small to medium dogs. Property is only minutes away from major shopping in historic Castle Rock including the Castle Rock Outlet Mall. 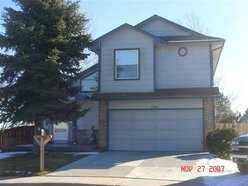 Great I-25 access providing easy commute to either Colorado Springs or the greater Denver area.